Some of you may already know this but I'm a huge fan of Emily Ley. 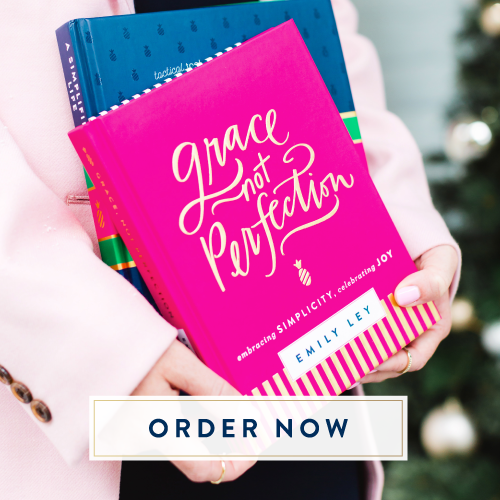 I've read both of her books "Grace Not Perfection," and "A Simplified Life." What I appreciate most about Emily and her books is her vulnerability, humbleness, and her priorities. Reading her books is like talking to a friend. She's relatable and funny while also giving practical advice. She also shares how she puts her faith and family first while still building her business. She is truly an inspiration. This line really resonated with me this week. As a creative soul and the wife to a minister, I often feel pulled in many different directions. I have passions and dreams that I want to pursue while also raising an active toddler and serving my husband. When life becomes especially chaotic, I often have to let go of a few things in my life, and usually, it’s something that I am personally pursuing. (ex. my blog) But when I become discouraged and feel like all I’m doing is mundane tasks I have to remind myself of what Ruth said, faithfulness begins at home. If I want to use my gifts and passions to create and serve others well, I have to first serve my family well. Whenever I think about the month of December two emotions come to mind, joy, and chaos. I’m mainly ecstatic and can’t wait for all the decorations and festivities to begin. But also when I think about this month I have this overarching feeling of overwhelm. On top of general holiday hub-ub we also have a conference we attend every year at the end of December. Not to mention our anniversary is December 13th, and other friends and families weddings to attend. Note: This is NOT the apartment that we stayed in, nor is it anywhere close. I just think it's a beautiful picture and appropriate for this post. Usually when I tell someone "we're going to be living at the beach for a month" the normal response I get is, "oh my gosh you're so lucky, how fun!" This post is to explain exactly what we do down at the beach for a month.